When McCandless’s innocent mistakes turn out to be irreversible and fatal, he becomes the stuff of tabloid headlines and is dismissed for his naiveté, pretensions, and hubris. He is said to have had a death wish but wanting to die is a very different thing from being compelled to look over the edge. Krakauer brings McCandless’s uncompromising pilgrimage out of the shadows, and the peril, adversity , and renunciation sought by this enigmatic young man are illuminated with a rare understanding–and not an ounce of sentimentality. Mesmerizing, heartbreaking, Into the Wild is a tour de force. 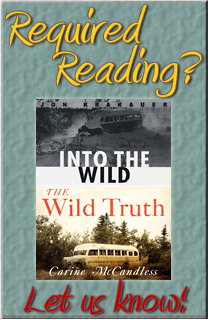 The power and luminosity of Jon Krakauer’s storytelling blaze through every page. Freshly graduated from college with a promising future, 22 year-old Christopher McCandless (EMILE HIRSCH) instead walked out of his privileged life and into the wild in search of adventure. What happened to him on the way transformed this young wanderer into an enduring symbol for countless people. 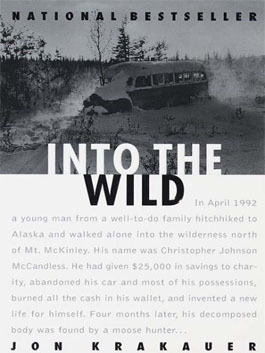 Was Christopher McCandless a heroic adventurer or a naïve idealist, a rebellious 1990s Thoreau or another lost American son, a fearless risk-taker or a tragic figure who wrestled with the precarious balance between man and nature? Each strand of his journey is woven into Sean Penn’s screen adaptation of Jon Krakauer’s acclaimed bestseller, Into The Wild, which is as much about the insatiable yearning for family, home and connection as it is the search for truth and happiness. McCandless’ quest took him from the wheat fields of South Dakota to a renegade trip down the Colorado River to the non-conformists’ refuge of Slab City, California, and beyond. Along the way, he encountered a series of colorful characters at the very edges of American society who shaped his understanding of life and whose lives he, in turn, changed. In the end, he tested himself by heading alone into the wilds of the great North, where everything he had seen and learned and felt came to a head in ways he never could have expected. Pearl Jam singer Eddie Vedder is one of rock’s most distinctive voices. The vocalist remains one of the most passionate and engaging frontmen in rock. 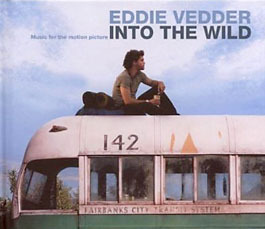 In 2007, Vedder was asked by friend Sean Penn to contribute music for his fourth feature-film Into the Wild about the young life of Christopher McCandless and his journey into the Alaskan wilderness. 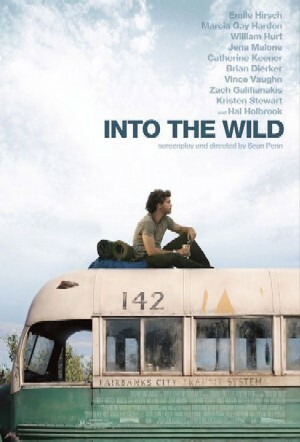 Produced by Vedder and Adam Kasper, the soundtrack to Into the Wild is Vedder’s first full-length solo release. The songs are a mix of the rock-inspired tracks that he’s known for with Pearl Jam with folk-driven songs that are almost reminiscent of the musical accompaniment of Cat Stevens. Featuring contributions from former Sleater-Kinney singer/guitarist Corin Tucker and singer/songwriter/guitarist Jerry Hannan, the soundtrack is a wonderfully enchanting, haunting, and inspirational album that not only showcases Vedder’s talents but also the serene, harrowing tone of Sean Penn’s film. Setting Forth is a jangly-inspired track with hard-hitting bass drums led by Vedder’s awe-inspiring vocals as he sets the tone for the entire album in this short, mid-tempo number. The track also includes Vedder playing some jangly-like guitar riffs and melodies that is also accompanied by acoustic backgrounds. No Ceiling is a slower, folk-driven song accompanied mostly by a banjo and a soft, slide guitar in the background. Vedder’s narrative-style lyrics definitely tells the story of Christopher McCandless going onto his journey to Alaska. Far Behind is a mid-tempo rocker that fans of Pearl Jam will definitely familiarize themselves with as the two-minute track is a nice accompanying track for a good road song. And no, this is not a cover of the song by fellow Seattle band Candlebox. Rise is a mandolin-driven track that continues the road-inspired narrative from Vedder’s lyrics as the song reflects McCandless’ journey while looking back at what he’s leaving behind. The two-and-a-half minute track is definitely an inspirational track with Vedder’s vocals being the highlight. Long Nights is an eerie track led by Vedder’s bass-like vocals and jangly-guitar flourishes that emphasizes McCandless’ isolation in the city and everything that he despises. Vedder’s vocals and lyrics reflects the sense of confusion in the film’s protagonist as Vedder’s guitar playing is wonderfully inspiring. The one-minute instrumental Tuolumne is Vedder playing an acoustic guitar with wonderful melodies and riffs that conveys McCandless’ innocence into his exploration of nature. The album’s first single Hard Sun is a cover of a Gordon Peterson song under his Indio pseudonym. The five-minute, inspirational song is played in the film’s final credits. The lyrics are definitely uplifting and reflect on McCandless’ journey. Vedder sings the song with his growling vocal style while accompanied by Corin Tucker. The song is played as a folk-rocker largely accompanied by an acoustic guitar that is followed by a drone-like guitar track that becomes a solo later on. Society is a Jerry Hannan-composed song that is mostly an acoustic ballad in the style of Cat Stevens. Vedder’s vocals definitely set the tone without being too soft as the song definitely plays as an accompaniment to McCandless’ journey and isolation with the world. The Wolf is a score piece of Vedder playing an organ that is also accompanied by Vedder’s wailing vocals. The track is played during McCandless’ confrontation with the harshness that is nature. End Of The Road is a slow but elegant track with Vedder playing flourishing guitar chords as he sings the song filled with his lyrics of McCandless’ journey. The song is a wonderful cut that plays to the film’s theme of movement as it emphasizes McCandless’ journey and the people he met on the way. The album closer, Guaranteed, is a folk-driven track that features Vedder in his most romantic as the song is played with just Vedder and his flourishing, acoustic guitar. The song is amazing with its imagery and is played during some lovely scenes of nature that revel in McCandless’ innocence and the tragedy that would follow. It includes lyrics that Vedder says he penned specifically for Chris’s sister Carine McCandless. After the song is played for three minutes, there’s two minutes of silence until it returns with Vedder basically humming. The result is a calm, serene closer that ends the album very nicely. The album in digital form, notably on iTunes features four extra tracks that include two original songs by Vedder along with a live version of one of those songs and a live cover of Phil Ochs’ Here’s To The State. While the only complaint of the record is that it’s 33-minutes (in CD form) – a bit short in comparison to other albums, the soundtrack to Into the Wild remains an inspirational album from Eddie Vedder. Fans of Vedder’s vocals and various side-projects will no doubt enjoy this album. Anyone who loved Penn’s enchanting drama should get the soundtrack since the music works very well with the film. In the end, the soundtrack to Sean Penn’s Into the Wild is a fantastic, enchanting, and spiritual album from Eddie Vedder.